Since the multiple text entry is a custom question set up, it won't be included as a part of the results/scoring - so you'd need to set up another question to track the value of that question. Since multiple choice questions allow you to score by answer, you could set it up to "select" the answer that matches the score the user is to receive based on the text entry. You could either move all the items off screen and add additional information there for the user to see - or set it up as a "jump to slide next slide " when timeline starts - and just ensure that trigger appears after the one to set the state of the question. Did you check out the Screenr that Jeanette shared on the first page of replies? It walks you through how to set this up. do you want to upload your story file - easier for someone to help you if we can see your setup. Just click the Add attachment button in the post and upload your Storyline file. Hi Patricia - there are several demo files in this thread that might help. I've got a few sample files posted (Page 2 I believe). If you open those and take a look at the triggers on the slide that might help you figure out how to set it up. There are also a few tutorials that might be helpful: Intro to Storyline Variables tutorial. And here's a link to the article on understanding and using triggers. I hope this helps! Let us know how you're doing. I was directed to this view from a question I had asked a Wendy Farmer pointed me to this clip, which has been very helpful. However, in the clip you have the submit button active. I am creating a software simulation want to learners to click on items from the software screen shot. I have used hotspots and directed the trigger to the hotspot rather than the submit button. But when I click it I don't get the correct or incorrect response. Would it be because my text entry boxes are on another layer? I am very new to storyline so not sure of my way round quite yet. Jeanette doesn't make it back to the forums as often, but it looks like you were getting a lot of assistance in the thread you referenced. Would you be able to share a sample .story file so that you could get further assistance? I was if you think its best to post the question there I will do. But here is a file anyway. The page itself isn't finished but the triggering and variables are at a point where i don't see why they wouldn't work. You watch it'll be something daft. Hi Marcus! I have not had a chance to put my finger on it yet, but it's due to the layers for sure. I've never seen someone set up a slide like this. If you're choosing to have all of the content displayed, could you not put all of this information on the base layer? I'd definitely echo what Leslie is saying that all the text entry boxes that you are trying to evaluate should be on the base layer where your correct/incorrect buttons are being triggered. Also in the 'incorrect' trigger, the condition should be OR not AND as any one of those entries that is not right gives an incorrect answer. I've moved the contents of the text entry and screenshot layers to the base layer - haven't done instructions yet. I also updated the incorrect trigger. I'm not a fan of hotspots so I created a transparent rectangle that I am using as the 'click' to submit...but you can try changing back to hotspot if you like - I hid the hotspot on the timeline by clicking the eye icon (show hide) next to it. I also moved it to appear after the zoom out finishes. Thanks for taking a look Leslie and Wendy. Leslie, that might be because this is my first time with Storyline, trying something complicated and I have always worked with layers in graphics, so I naturally though to separate parts into layers. I assume this is not best practice with Storyline? What would the layers be used for then? Wendy - it does work now great thanks. Hopefully this with work as a template for the other slides I need to create. I will continue with the transparent rectangle in future. Thanks again for the help. No doubt if this is successful and we start using storyline more, I'll be on here more often. Shout out if you need any more help and good luck with your project. I said I would be back. Is a way of setting up a further trigger to allow the learner to hit a key e.g. tab or enter to then move to the next text entry field? that was quick. On the Home tab, near the Layout option is the Tab order option. This allows you to set a custom order when the learner tabs between fields. You will notice a yellow box that highlights the field that is tabbed to - this is for screen readers and accessibility. The link was great sorted it out quickly. Must remember to do that on the master slide at the start of every project, lots of time saving there. Hi Marcus! Glad that Wendy was able to assist you here. In regards to your question above about layers - we have a great tutorial here that may assist. Thanks Binda - the image you attached is a bit blurry but it sounds like you were able to find a method that worked for you, so hopefully you're all set. I have been trying and trying to make this work in my project. I feel I have everything set up correctly but the Try Again layer will not pop up. The Correct layer works as it should. Any feedback would be greatly appreciated! Thanks for sharing your set up here - and I can see that the items are being selected, but nothing is being "submitted" so the correct and try again layers are not showing. You could add an additional trigger to submit the interaction when the user clicks "check answer" and just ensure it's listed below the triggers to adjust the state of your incorrect and correct buttons. Something so simple! Thank you Ashley! That worked. Thanks for the nice comments. Really appreciate it... 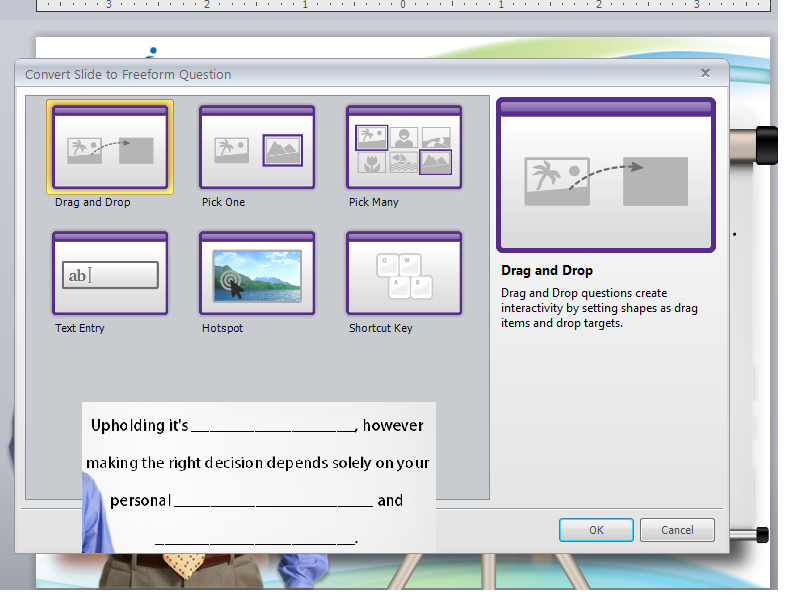 I am enjoying using Articulate Storyline for my projects... A great thanks !!! Happy to help Binda and feel free to keep us posted if you need anything else.